To any kid, boy or girl, playhouses have a mysterious attraction. 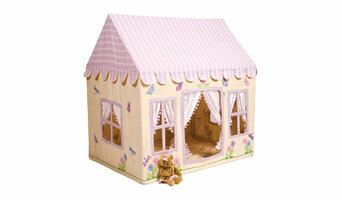 To many adults, playing in their wooden playhouses as kids are among the most treasured memories. However, nowadays, as parents are more and more sucked into busy work schedules, it has become more difficult for kids to enjoy the playthings that their parents used to enjoy. In order to help ourselves and many like-minded adults to preserve this piece of cultures that is slowly fading away, we started Playhouse of Dreams. Playhouse of Dreams is one of the fastest growing online retailer providing a great selection of indoor and outdoor playhouses at competitive prices. We understand that the amount of effort it takes to buy and put together a nice playhouse sometimes deters people from getting one. We aim to make your purchasing experience as memorable as possible by providing all the information you will need to make your decision, offering quality products, and giving assistance at any step of the process. Based in Vancouver, WA, we have offices and partners nationwide. Over the years, we have managed to build up a great online reputation, great selections of playhouse and playhouse-related products, and a dedicated support team who are also passionate about playhouses. If you have any question about our products: whether it’s an outdoor playhouse, a wooden playhouse, or simply the availability of some product, we are more than happy to give you an answer. Please use our support page to get in touch. With little ones in the home, safety is likely foremost in your mind, especially for structures that are designed for them to climb on, swing from and jump over. If you’ve decided to add an outdoor play system to your yard, it’s well worth hiring a Portland, OR professional to craft one that’s solid and secure. Even if you choose to purchase a kit, an installer can ensure that it’s put together correctly and that it will hold up with heavy use. Outdoor play system professionals design and build custom playhouses, playsets and other equipment, and also install prefabricated kits. They can design a playhouse to look like the main home or come up with a completely unique concept that suits the parents’ and kids’ fancies. Because playset kits can be quite tricky and time consuming to assemble, many Oregon homeowners hire professionals to handle the job both for convenience and for peace of mind with regard to safety and structural integrity. Here are some related professionals and vendors to complement the work of outdoor play systems: Backyard Courts, Landscape Contractors, General Contractors, Woodworkers & Carpenters. Find an outdoor play system professional on Houzz. Narrow your search in the Professionals section of the website to Portland, OR outdoor play systems. You can also search farther afield for a pro who fits your project’s needs.